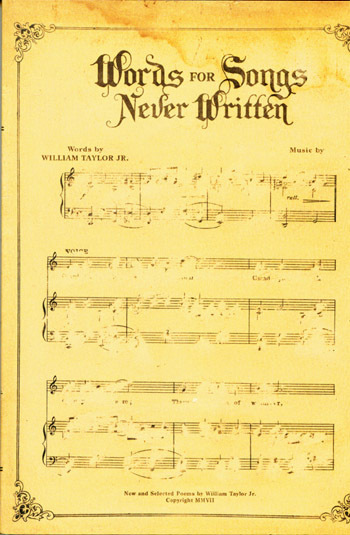 William Taylor Jr.’s last collection of poetry, Words to Songs Never Written, is a must read. I will admit that I find little that holds my interest in contemporary poetry. I discovered Taylor after I discovered A.D. Winans. Maybe it was Winans that pointed me his way, maybe it was google. Anyway, his name kept popping up in various online publications. I took a look and I liked his work. He was compared by some reviewer as picking up where Bukowski left off. I am not sure I agree with that or if that remark could be the kiss of death for any new poet or at the least–just plain foolish. I picked up his first book, So Much is Burning on Amazon and liked it. But Words to Songs Never Written is by far the best collection, bar none, I have read lately. When I first read his work online, I thought it as worth reading but labeled it without any grit. After all, walking the streets of San Francisco looking for material and slipping in a back alley bar for a cold one—should have some grit. When I read his collective work I changed my mind. Taylor doesn’t need the grit of Bulowski or anybody else. He has his own voice—a seemingly gentle, yet true voice centered on observing life seen on the street and neighborhood bars in his city. Taylor sees life through a poet’s eye–a little bit differently. He lets you look at the world through the eyes of someone who sits on his roof on the Fourth of July drinking wine waiting for the first hint of the sun telling the world what he thinks. Outside of writing he appears to be a good soul–someone you wouldn’t hesitate having a drink with. That persona comes through in his poetry also. I ordered my copy from Taylor and when it came in the mail, it was late fall. I had just raked the damp leaves around my yard, had them piled up and was watching them smoke and smolder—not wanting to burn. They were a good 20 feet from my greenhouse, so I sat down on the porch and began reading. About halfway through I smelled something like plastic melting. Yeah, the pile of wet did burn and the wind blew a spark up against the greenhouse catching hold of some already dried leaves—melting the bottom two feet all the way around the structure. This filled the greenhouse with thick smoke and nearly burned down the house as it is connected. Like I said, I am not one easily captivated by much of anything. But there was something fresh and unique in his voice. I couldn’t put it down. So hire the yard work out, get the book, bookmark his web site and stay tuned for his next release from Sunnyoutside Press. You won’t be disappointed. And if you wait long enough, the wind will take care of the leaves. My last talk with this poet went like this. Scot:	Who were your early influences when you began writing poetry? William:	I first really started writing poetry late in High school, and I remember being really into some of the Romantics; Byron and Shelly in particular. Soon after, I discovered Thomas Hardy and e.e. cummings, both of whom I also loved (and still do). So my earliest work was of a rather archaic, romantic nature. Rhyming and strictly structured. Sonnets and what not. Scot:	How often do you write? Do you have a routine? William:	I’m always jotting down phrases and ideas as they come to me, but I do most of my writing a few days a week when I don’t have to work. I’ll get up and work on some pieces, edit some stuff, try and put together all the scraps of ideas I’ve collected over the week and see what I can do with them. Later in the day I’ll take a walk around the city, have a drink here and there, and collect more images and ideas. it’s an ongoing process. Scot:	Many say nobody reads poetry anymore—if true why is that? William:	Poetry is generally pretty low on the average person’s list of things to read. Everybody writes it but nobody really wants to read the stuff. People either think of poetry as very academic and incomprehensible to the average reader, or just really sappy, teenage journal kind of tripe. And this reputation is at least partially well deserved. There’s a lot of bad poetry about, it’s hard to make the time to slog through it all it find something that is real and well done. Scot:	What poets do you read? William:	Two poets that I always go back to for inspiration are T.S. Eliot and Robinson Jeffers. I can just pick up their work and read a bit and be reminded why I read/write this poetry nonsense in the first place. As far as more contemporary stuff, there’s some good folks in the small/independent press: MK Chavez. Christopher Robin. Miles J. Bell. Chris Cunningham. Hosho Mccreesh. Some others. Scot:	What advice were you given as a young poet? William: I don’t remember being given much advice as a young poet, other than “stop	that nonsense and find something useful to do”. 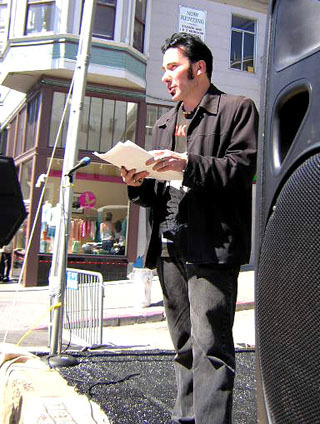 Scot:	Has living in San Francisco helped you develop as a poet? William:	I think so. It’s a great city with a lot of distinct neighborhoods and a lot of rich literary tradition. All you have to do is step outside and walk around a bit…you’ll find something to write about. Scot:	What does it mean to be a poet? I think a poet, and an artist in general is someone who is affected by life in a way perhaps a bit more intense than other people. They feel and see things that others might not notice and have the ability to express them in a way that reveals to people ways of seeing that they might not have discovered on their own. Scot:	How did your first book deal come about? William:	I’ve done a number of chapbooks over the years with numerous small presses, but my first real book was published by sunnyoutside press. They had published my work in the past, when it was an online journal, and when they started doing books, I guess they were kind enough to think of me. It was a similar thing with the book I did with Centennial Press. I had been published in Anthills, the literary journal published by Chuck Nevsimal of Centennial Press, and we had been planning on doing a book together for some years. And when the time was right it happened. I’m currently working on a new collection with sunnyoutside. Scot:	If you were left on an island with one book of poems or a single author’s work—what/who would it be? William:	Gosh, I imagine it would have to be Jeffers. His collected works. He’s got an amazing body of work, and his vision and poetry always puts my head in a good place. Scot:	I have read the North Beach poetry scene has died. Is there a community of poets still thriving there? William:	I go by North Beach once a week or so…there’s still a few decent bars and some interesting folk to be found. There are still readings and open mics and people still hang out at Cafe Trieste and drink coffee and wear berets and call themselves poets. I’m not sure how much good poetry is actually being created. There is the sense of people still trying to hold on to the beat thing, but that era has come and gone, and it’s a bit sad to try and pretend it’s still going on and that you are part of it. And these days North Beach is way too expensive for your average poet to live in. As is San Francisco in general. You can safely say that North Beach is not the epicenter for groundbreaking poetry that it once was. Scot:	Are there any new poets out there that will change the way we look at poetry? William:	I’m not sure if I know of anyone out there right now who will exactly change the way people look at poetry…as time goes by it gets harder and harder to do something really new…I think it is enough to have an original voice and say what you have to say in your own distinct fashion. That being said, I think the work of Christopher Robin out of Santa Cruz is a largely undiscovered gem. Scot:	What is one thing about William Taylor Jr. that we don’t know but need to know? William:	I don’t know if there’s anything that needs to be known. When not writing poetry I am probably reading comic books or playing videogames. Scot:	If you had the opportunity to talk to any poet who would it be and what would you say? William:	I would like to have had the chance to share a few drinks with Anne Sexton. This entry was posted on Monday, June 23rd, 2008 at 1:55 am and is filed under poetry. You can follow any responses to this entry through the RSS 2.0 feed. You can leave a response, or trackback from your own site. This was a great interview. It is interesting that we all seem to assume that writers of poetry, or any type of literature, for that matter just produced a book out of thin air. This interview gave such a great insight into the author. Really gave him an identification and a background. Your questions were asked so well. He is a real person, and I think it is so easy to forget that of people who write. They had to come from somewhere as did their inspiration. This was so well done… Glad that I stopped in. I read the interview from top to bottom.. Great job.. I have another one on A.D. Winans waiting backstage. Thanks for stopping in. I appreciate your comments. He sounds like such a good guy…..I loved his answer to the advice given him as a young poet. I will check him out some more. Great interview, Scott. Thanks for sharing. I am eager to read this poet’s work. like I said–go beyond the web site–his last book is a keeper–sitting close at hand. Nice guy?–yes indeed–no ego showing through, rare in most poets. Thank You, glad you liked the interview–I’ve got a feeling you will like his work. That picture is just outside the Triesste, isn’t it? The idea for a book morphed from chapbook to something more substantial pretty quickly … a New & Selected? Why the hell not? So we went for it. And God bless Bill for his patience, cuz it took me four years to save enough money to be able to do this right … to give his words the proper home they deserved. Your kind words add to my inherent confidence that we’ve, in fact, done just that … made something beautiful together (William and Centennial Press) that will live in this world for a very long time. So thank you. I appreciate it greatly. And I want to make a plea to your readers (past, present, and future). PLEASE support the small press. Support Centennial Press by purchasing this book from us. It was one hell of an investment (worth every penny, Bill being the fine poet that he is). But the money came all out of pocket. So if you’re going to buy this book … and I really hope you do … please buy it from Centennial Press direct. It’s my plea to you. And to sweeten the deal, if you DO buy from us … mention Scot’s interview and I’ll throw in a FREE numbered and signed broadside of a poem written by small press legend A.D. Winans! Support Centennial Press and buy Words For Songs Never Written. I guarantee it’s one of the best books of poetry you’ll ever read. William Taylor Jr. is a poet who doesn’t work with words, he works with magic. I concur with chuck at Centennial. it’s one of the finest collections of poetry anywhere these days and WELL WORTH the investment. A thoughtful, considered interview with who I consider one of the best poets writing at the minute, anywhere. I message Bill now and again and we swap chapbooks, and it’s always a pleasure – the guy is a gentleman and refreshingly free of ego and bitterness. Very good interview. I’m glad you sent me the link. He seems to live in a very masculine world, bars, street life, city life, male poets, except he does mention MK Chavez. I just wrote a poem about scrubbing the bathroom! Any way, it’s an entertaining interview, as well as informative. Nice to see his photos too. Sad, about beat times of the past no longer to be enjoyed live, only on the page, or from recordings. But the spirit lives on. I think I’m a lot different from you. I fall in love easily with lots of new poets (poets new to me). I will read Taylor’s work, probably will love him. poetry off of Pirate’s Bay for as long as I can remember.